I am not a Henry Waxman fan. However much I dislike Waxman, it is minor compared to my feelings about my tax dollars being spent to prop up our banks. Henry A. Waxman, a California Democrat who heads the House Committee on Oversight and Reform, sent letters this week to the chief executives of nine banks slated to receive $125 million in aid from the Treasury Department. He requested information on their compensation and bonus plans, noting that public filings show that those companies spent or reserved $108 billion for those purposes in the first nine months of 2008 - nearly the same amount as last year. Waxman noted that some news reports suggesting that year-end bonuses would be bolstered by the infusion of federal money. "While I understand the need to pay the salaries of employees, I question the appropriateness of depleting the capital that taxpayers just injected in the banks through payment of billions of dollars in bonuses, especially after one of the financial industry's worst years on record,'' he wrote. Monday morning I felt like crap. Headache, screaming bowels, and general mailase. Of course, work was a diasaster. We had a major customer in crisis. Got work at 7am and worked straight through to 7pm with no break. Sheesh. And it was cold and windy outside. Somewhere in there I figured I would abort the workout plan for the day. The plan was 50 min run with a 40 min Fartlek. I contemplated a 30 minute easy jog, but I was never able to make that happen. Instead I took a rest day. This was the fifth rest day of 2008. The last one being my "taper" before the Tri-Rock on August 22. House Republicans voted down the first bailout bill because they were afraid it would become just another government boondoggle. But after it was loaded up with more pork than all the pigs in Iowa, they changed their minds. Guess what? It has become just another government boondoggle. Sec. Henry Paulson's idea was to buy up all the toxic mortgages to get them off the banks' books. He long since shelved that plan. His next idea was to buy stock in the banks so they would have fresh capital and could start making loans again. However, instead of making loans, some banks are using the money to pay dividends, give executives bonuses, and buy other banks. For example, PNC Financial Services received $7.7 billion in government money and promptly spent $5.6 billion of it to buy National City Corp. Lawmakers are protesting but they should hardly be surprised since they gave Paulson unlimited authority to spend the money any way he wanted to, with hardly any supervision and no restrictions on what the recipients did with the money. In addition, Paulson hired the Bank of New York Mellon to run the program. On the same day Bank of New York Mellon received $3 billion itself, apparently deciding that it could use some cash. Hardly anyone noticed. Mark Cuban's BailoutSleuth dot com is covering these developments in pretty good detail as well. I have zero confidence in either parties ability to fix these problems. After the race on Sunday, It would have been a better thing to do something easy. Instead I forged ahead with my planned fartlek, and not having a good route in mind, I did 15 minutes more running than the schedule called for. Needless to say, my legs were shot after that run. Wednesday morning I drove to Austin to work out of the office down there. There is a lifetime fitness just north of our office down there, so I stopped there on my way back and did my hour run. Strangely, in the locker room I ran into an old co-worker from Dallas that I had not seen in four years! Saturday I had hoped to get up at ODark Thirty and run Flywheel golf course. Instead I woke up too late to get in 90 minutes and get back in time to get Marissa to her soccer game. Instead, I barely had enough time to squeeze in 90 minutes between bringing Marissa back from her game and getting Logan off to her game. (Sheesh). So I had to hammer it. And I did. I had been running this loop in 90 minutes, and yesterday I did it in 81. Smoking! Today, Vic, Terry and I had a pretty easy 50 mile bike. It was a little cool at the start, but once the sun came up it was spectacular. Last week when I was signing up for Blackland, I bought a new pair of bike shoes. Today was my first ride with them and they felt great as well. Saturday Oct 25 - 10.9 miles run 81 minutes. Sunday Oct 26 - Ride with Vic, Terry, and Mike K up to Windhaven. Ave 15.8; cad 70; ride time 3:15. 51.5 miles Bike. Last week I got supplies for two more batches. Since I bottled the Oct 12 Batch, a fermentation tank was available for new batch. The Oct 18 batch was also the last batch with the Challenger hops. The closest thing that they had in stock was Cascade. So these next two will not be quite so "hopped up". Update Nov 1: Specific Gravity 1.022. Racked the wort, added .5 ounce of Glacier Hops. Update Nov 9: Specific Gravity 1.017. Added 1.5 quarts of gyle and put this in the bottle. Update Nov 16: First Sample - Very nicely done. Not too much head. Could have done 2 quarts of gyle. Very similar to the last batch. Update Jan 11: This was a very nice batch. Slightly under carbonated. On the right, last week's batch photo taken at high krausen. 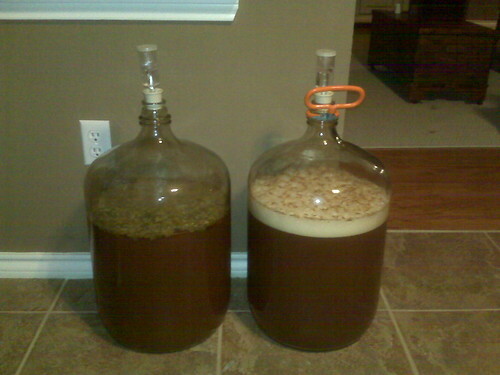 On the left, the brew from the week before. With hops floating in the tank! Yum! I had kinda been thinking that if the weather held up, I might do one more Triathlon this fall. 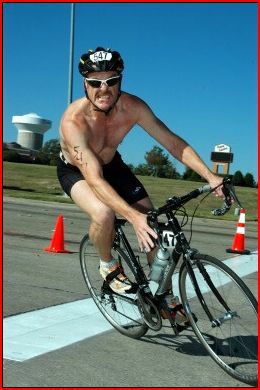 I had been toying with the idea of doing The Monster Triathlon in Keller, Texas. This race starts with a 300 Meter Pool Swim set up long course (50 meter lanes) with really wide lanes. But on Friday, as I scanned the newspaper for the race line up this weekend, I noticed that there was a Triathlon right in my back yard, The Blackland Triathlon. Blackland also was set up for a long course swim, advertised as 300 yards. I found out later they were going to run this short course for 300 yards, but changed the setup to long course at the last minute - which also changed the swim to 300 Meters. The bike was right down Los Rios, a road that I ride on a regular basis. And the run was net down hill with a nice grass section and a slight up hill finish. PERFECT! Fran gave me approval. Packet pickup was a plano cycle, so I went down there yesterday to sign up. Now I figured that this would be a small event. Heck I never heard of it before. Nor had I heard of the race director. (Turns out it was his first race, which explains both.) But when I forked over my dough - they gave me race number 547. I looked at them dumbfounded. I know that I was dumbfounded because they looked at me asked if everything was all right. I asked them if they were going to start the swim by number. And they confirmed that. Ouch. It turns out that the race sold out a full 500 participants. So, they were going to start the swimmers every 10 seconds. That is 350 or so swimers in an hour. The race was scheduled to start at 9:30. If I got into the water before 11, it would be miracle. The situation was complicated by the kids schedule. Reagan had to be all the way across town by 1pm for soccer and Fran had to leave at noon to get her there. Logan had to be at a game on the other side of town by 2pm. The only way this was going to work was for Fran to bring me Logan at noon. But if I started at 11 - then I would not be done by noon. Tricky. Add to that they got the race off five minutes late. And they were indeed starting the swimmers every ten seconds. I walked back to the transition and called Fran. I went to the car and put on sunscreen. At 10:15 or so, I went back to the pool. They were about half way done. In fact they were moving along much faster than expected. I got in the warmup lane and did a 100 hard, got out and lined up - about twenty swimmers in front of me. I am not sure of the exact time I started, but well before 11. In fact, given my gun time, it must have been 10:28! The lanes were pretty wide, and I had to use all of them. I passed a buncha people on my first lap, did a flip turn and found three people blocking my way. I had to stop until they got going, then I passed all of them, and I was much more careful to line up my turns without hitting congestion. I was passing people left and right in the pool. And although I was mostly trying to pass on the left, I had to split some folks and even pass on the far right at one point. By the time I got to the last 50, there was actually no one in front of me. I sprinted the last lap, and got out and ran to transition. That was the 8th fastest swim 300 meters in 4:45. This was the first pool swim where I did not get passed in the pool. I got through the T1 pretty efficiently and got out on the bike. I knew these roads inside and out, and they did a really great job with traffic and directions. We had what felt like a pretty strong south wind, which was exactly the way the race started. There were three pretty substantial hills on the race course too - but we would have the wind to our back for two of these. I was passing like crazy, and also having to remind tons of riders to MOVE TO THE FRIGGING RIGHT! Sheesh. I was 27th in the bike in 39:59 for 13.5 miles. This was my first Triathlon where no one passed me on the bike! I got off the bike and in out of the T2 in 45 seconds - the fastest T2 in the race. It took a couple hundred meters before my calves stopped threatening to cramp on the run. I pushed as hard as I could and really worked on my turnover. I was passing people all over the place. Most of the last mile was on Grass. I run on grass most of the time when I train, so I was just loving this. Then a slight up hill at the end. And then a sprint to the finish. Done! Wow. That felt really good. I was fourth in the run behind a 23 year old guy, 29 year old girl and a 33 year old guy. I guess I need more work on my run. Hey who put this number belt on upside down?? I hustled up to the transition area and while I was messing with my stuff, my phone rang. It was 11:45 and Fran had Logan by my car. I love it when a plan comes together. We had about an hour and a half before we had to leave for her game. She and I went back to the finish, where I had a couple of Saint Arnold Beers. While we waited for the awards. As Logan and I were prowling around, we ran into my buddy Lydia, who had been threatening to do a Triathlon for a while. Today was her first ever, and she finished 4th in her age group! Not too bad! Lydia on the right, in her first ever triathlon. Welcome to the Dark Side. Fran had Reagan across town at a Gym Meet this morning. Marissa and Logan were clear until later in the afternoon. That meant I had enough time to fire up the Texflats Brewery this morning! This will be similar to last weeks batch, except I do not have any more Hallertau hops. Replacing that with some Glacier Hops. Update Nov 01: Specific Gravity: 1.017. Before bottling we would like to see a lower specific gravity. But as I need to move production forward, I think that I will bottle this batch, but instead of added two quarts of Gyle for bottling, I will only add one quart. Update Nov 09: Sampled the first bottle of this batch. Perfect! Circuits are starting to take their toll. Lots of aches and pains. I thought it would be better to log two long bike rides this weekend rather than one ride plus one long run. Next week starts transition to speed! Yippee! Terry and I had nice ride on Saturday around Lake Lavon and out to McKinney. Sunday I did a loop around the lake, but with the east wind, my last eight to ten miles were into the wind. Boy was I tired. Monday Oct 06 - circuits wk 7 - carpenter park - plus 90 pushups, 150 crunches (161) 5.5 Miles Run. Thursday Oct 09 - circuits wk 7 - carpenter park - plus 95 pushups, 160 crunches (161) - 5.5 miles run. Sunday Oct 12 - Solo Ride around White Rock Lake - 3:18 (17.2 ave, 80 CAD) 54.2 miles bike. After last week's tri, this week was about working on strength. And it is feeling pretty good! Vic was dragging a bit during our Sunday Ride - but still not too bad. Monday Sep 29 - Circuits Carpenter Wk 6 inc 91 pushups and 145 situps. (162) 5.5 Miles Run. Thursday Oct 02 - circuits wk 6 - plus 90 pushups and 150 situps - carpenter park (161) - 5.5 miles run. Sunday Oct 05 - Ride with Vic around White Rock Lake - 3:18 (16.6 ave, 76 CAD) 55 miles bike. This September was more balanced between the bike and run compared to last year. Of course last year, my knee was fried. This year, I had a very nice race. Update Oct 25: Specific Gravity: 1.012. Added two quarts of wort and put in the bottle. Update Nov 2: Put this batch in the fridge. The head is perfect, as is the taste - nice and tangy! I had hoped to get a second fall triathlon in after the Tri-Rock, but its tough with the schedule. 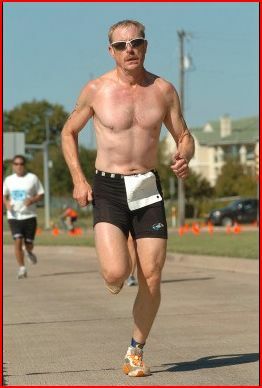 Fran agreed that I would have time to do the Stonebridge Ranch Triathlon this week. I have been training pretty hard AND I was nearly sick last week. So I decided to lighten up the load this week. Tuesday, I changed the swim from my usual assortment of intervals, to two 1000's! The pace felt really good, and I even had a guy at the pool tell me that I was "hauling". I cut down my 60 minute run on Wednesday to 50 minutes, and then I really cut down my swim on Friday to 1500 - three 500's, half of the usual workout. Saturday I did 40 minutes easy. All of that worked perfectly as I had a darn good race on Sunday, winning the masters competition. 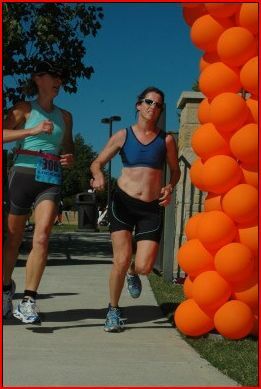 Sunday Sep 28 - Stonebridge Ranch Triathlon - 750M Swim, 12 mile bike, 3.1 mile run, 3.1 mile cooldown.